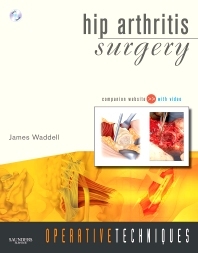 This multimedia resource offers you all the how-to guidance you need to perform all of the latest and best techniques in hip arthritis surgery. The complete, lavishly illustrated volume is made even better with a bonus DVD and a state-of-the-art companion web site! With chapters on such topics as femoral revision impaction grafting, intertrochanteric fractures, and total hip revision, you, as well as the members of your cross-disciplinary team, will appreciate the clear and concise, but detailed and visual approach of this atlas and video collection. Allows full-text web access and links to PubMed through the fully searchable online component at www.operativetechniques.com. Includes a DVD with over an hour of video clips of experts performing key techniques, such as Cementless Acetabular Cup Technique. Uses step-by-step intraoperative photos demonstrating each technique, such as Acetabular Cementless Revision and Bernese Periacetabular Osteotomy and radiographs showing presenting problems and post-surgical outcomes. Incorporates full-color photographs and interpretive diagrams that highlight key anatomical structures. Contains pearls and pitfalls from the authors to improve the quality of your technique and optimize outcomes. Provides important details on positioning, exposures, instrumentation, and implants. Presents a hands-on, clinical emphasis to give you just the information and guidance you need.